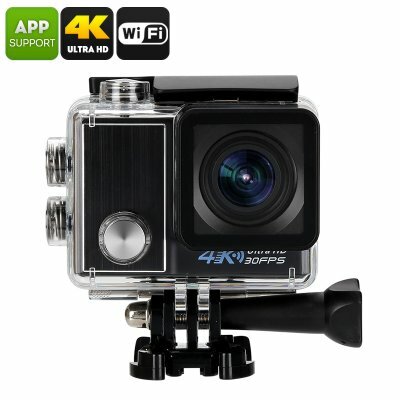 Successfully Added Ultra-HD 4K Action Camera - 1/2-Inch CMOS, 2-Inch Display, Wi-Fi, IP68 Waterproof, 170 Degree Viewing Angle, 4x Zoom (Black) to your Shopping Cart. No matter where your upcoming adventure, road trip, or holiday will take you – with this Ultra-HD 4K action camera at hand you’ll always have the means necessary to capture and record all happenings in absolutely stunning beauty. With its miniature size and light weight design, this sports camera can be easily carried around at all time. Additionally, it can be efficiently equipped to other surfaces such as, for instance, your helmet or bicycle. Coming with its own protective IP68 waterproof case, this action camera is capable of shooting the sharpest images up to depths of 30 meters under water. Whether you’re into skiing, diving, parachute jumping, or simply are looking for an action camera to shoot stunning holiday footage – this 4K camera is guaranteed to meet your demands. Featuring a 1/2 –Inch CMOS sensor, this sport camera is capable of shooting highly detailed images in stunning 4K resolution at 30FPS, ensuring that even while moving in fast speeds this camera will provide you with clear footage. Besides shooting mesmerizing video this action camera also lets you snap breathtaking 16MP images, allowing you to snap professional-grade photographs with a camera that fits within the palm of your hand. Supporting 4x digital zoom it will additionally allow you to snap images from afar, and along with its 170 degree viewing angle you can be assured that nothing happening in your surroundings will stay uncaptured with this beautiful 4K camera in place. With its 2-Inch LCD display, this sports camera allows you to instantly watch back all your recordings. Wi-Fi support furthermore allows you to share your recordings with friends and family back home or simply save them within your cloud server for safe keeping. Packing a 900mAh battery, this Ultra-HD 4K action camera lets you record up to 50 minutes continuously, supporting plenty of time for you to record the most important happenings during your upcoming adventures. Supporting a hand full of different recording modes, this 4K action camera is perfect for extreme sports addicts, outdoor enthusiasts, and people who simply want to have a compact 4K video camera at hand to capture their upcoming holidays. With its time lapse, timer, loop recording, and four different burst modes; this action camera is guaranteed to deliver the right type of photography and movie shooting no matter what you’re in too. Its built-in mic additionally allows you to record high-quality audio, further enhancing the mesmerizing quality of your recordings. No matter where you’re headed, with this 4K camera at hand you’ll always pack the means necessary to shoot incredible footage that allows you to share and recall all your amazing memories in stunning resolution. Arabic: - 4 ك عمل الكاميرا - Chinese Simplified: - 4k 行动相机 - Czech: - 4K Action Camera - Dutch: - 4K-actiecamera - French: - Caméra d’Action 4K - German: - 4K-Action-Kamera - Hebrew: - מצלמה פעולה 4K - Hindi: - 4K कार्रवाई कैमरे - Hungarian: - 4K Action fényképezőgép - Italian: - Macchina fotografica di azione di 4K - Japanese: - 4 K アクション カメラ - Korean: - 4 K 액션 카메라 - Malay: - Kamera tindakan 4K - Norwegian Bokmål: - 4K Action-kamera - Romanian: - Camera de actiune 4K - Russian: - Камера 4K - Spanish: - Cámara de acción de 4K - Thai: - กล้อง 4k การกระทำ - Turkish: - 4K eylem kamera - Vietnamese: - 4K Action Camera.